Panasonic has announced a new 50-inch 1080p 3D Plasma TV, with a prototype set to be unveiled at the Ceatec show in Tokyo in early October. If you happen to be at Ceatec Japan on October 6 then be sure to pay a visit to Panny's booth where the company's 50-inch Full HD 3D compatible plasma display panel (PDP) with high-precision active shutter glasses will be there for your viewing pleasure. 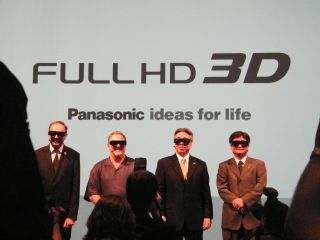 Panasonic hopes to make the new 50-inch 3D Plasma available to consumers at some point in 2010. Panasonic informs us that the latest 50-inch 3D PDP "uses Panasonic's newly-developed high-speed 3D drive technology that enables rapid illumination of pixels while maintaining brightness"
The press release continues: "The panel also incorporates a crosstalk reduction technology allowing for minimising double-image (ghosting) that occurs when left- and right-eye images are alternately displayed." The new 3D PDP and glasses evolved from Panasonic's world-first Full HD 3D 103-inch Plasma originally developed back in 2008. 50-inch is expected to become the most popular size for 3D TV in the home. Panasonic hopes that it can be the first to market with its "original Full HD 3D technology to create synergy between PDPs, which excel in moving picture resolution and colour reproduction, and Blu-ray Disc players, which are able to faithfully reproduce high quality Hollywood 3D movies." Ceatec Japan 2009 is set to be held from October 6 to 10 at Makuhari Messe in Chiba City, Tokyo. Read more on our recent thoughts on Panny's move into 3D from IFA 2009.